Dentist in Canberra - Weston Dental Surgery. Call 02 6288 9448. Weston Dental Surgery was established in 1990. Since then, our guiding principle has been ‘Help Ever, Hurt Never’, which is based upon the premise that we should always try to help others and minimise hurt inflicted by thought, word or action. We offer a range of general and cosmetic dentistry services suitable for the whole family at Weston Dental Surgery. 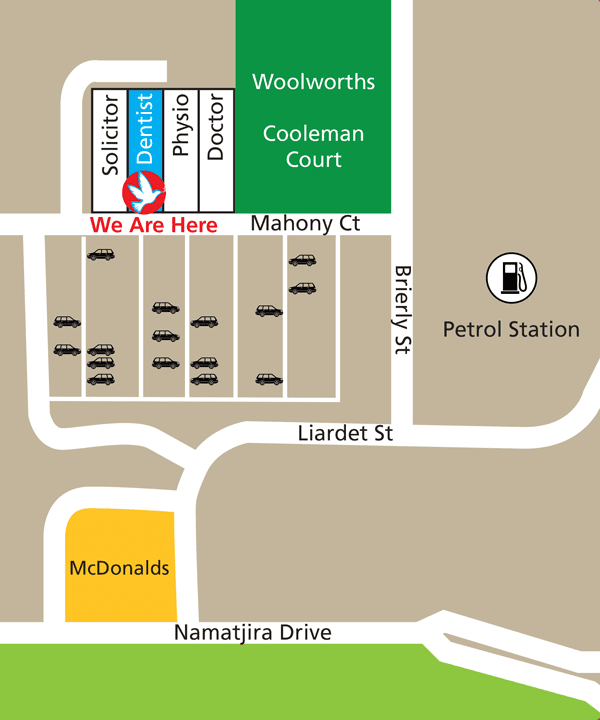 We are located in the Canberra suburb of Weston Creek. "We've been using this dentist for many years and even after moving to the other side of the city, continue to go there. The staff are friendly, kind, gentle and caring and provide exceptional service. I have recommended them to a number of friends and don't hesitate to recommend them again." "Returned here after using other dentists who were closer to work. They were superb. I won't make the mistake of going elsewhere again." "Excellent service, very gentle and understanding. Highly recommended." "A wonderful, personal, caring Dentist - my wife and I count ourselves lucky to have found them 10 years ago, and recommend them very highly." "Best dentists in Canberra, caring, competent and passionate, been with Dr. Naren and Dr. Nithya for years and the level of professionalism and service has been outstanding!! Thank you"
"I never really had a regular dentist until I discovered Weston Dental Surgery. Now I don't have to look any further. All the staff are warm and friendly and very professional too - a great balance. My daughter and I are both delighted with our experience and will continue to be regulars for a long time to come. Thanks guys for being such a pleasure to deal with." If you require teeth whitening and bleaching, then Weston Dental Surgery Canberra can provide these services for you. We are the experts in Canberra! We use the Smartbleach® treatment system for teeth whitening. This has proved to be one of the best systems available today. We are one of a select few Dentists and Orthodontists in Canberra that can offer this system to you. Please give us a call for any enquiries. Having regular dental check-ups and cleaning helps to avoid cavities and gum disease, this is where we can help with Canberra dental care services at affordable prices. We recommend having either annual or six monthly check-ups to keep your teeth and gums in pristine condition. If you require a dentist in Canberra, especially the Weston Creek or Woden region, then we are here to assist you. If you are looking for a long established family dentist in Canberra you can trust, and who provides superior customer service, then look no further than Weston Dental Surgery. Our guiding principle of ‘Help Ever Hurt Never’ is what we have believed in for over 25 years of practice. We are located next to the Cooleman Court shopping centre, which is ideal for families to visit in a convenient location. If you need a Weston Creek dentist, or a Woden dentist, or even a new Canberra dentist, look no further. Our dental practice covers both the Woden and Weston Creek region, and the whole of Canberra! At Weston Dental Surgery, there is an emphasis on dental for the whole family, and childrens dentistry is an integral part. Regardless of your age, we take pride in making sure all of our patients receive the best care possible. We use the latest CEREC technology. Our team of dentists can fit crowns in one day if you require same day service at our Weston Creek dental surgery. Some of the advantages to having crowns fitted on the same day are; no need to visit the dentist multiple times, only one injection needed, no need for a glue impression in your mouth, say goodbye to a temporary crown and you will not need to return to the dentist to have your new crowns cemented. If you are looking for this option of same day dental crown treatment in Canberra, especiallly in the Weston Creek and Woden region, then give us a call at Weston Dental Surgery, Canberra. A dental emergency can happen at any time of the day and the night, this is why we have emergency appointments available every day for you. If you need a Canberra emergency dentist, then look no further than us at Weston Dental Surgery for the best advice and care. One of the most important aspects of oral health, is having regular dental hygiene treatments. We can provide modern dentistry techniques with our expert hygienist. Having good oral hygiene is a vital factor in preventing gum disease and cavities. Our hygienist works alongside our dental practitioners to give you and your family the best care possible at our dental surgery in Canberra. Ever thought about getting dental veneers in Canberra? If you are looking for cosmetic dental procedures, here at Weston Dental Surgery we are experts in aesthetic and cosmetic dentistry. Whether you require dental veneers, crowns or bleaching, give us a call today to find out more! Let us see what we can do for you at Weston Dental Surgery. Wisdom teeth can be a painful experience and a cause of massive discomfort. Here at Weston Dental Surgery Canberra we can help with this problem with regular x-rays and check-ups. One of the most important times for regular check-ups for wisdom teeth is during the adolescent years and we can plan for this eventuality for your children. Furthermore, we offer the same level of security and care for all ages. If you require wisdom teeth removal Canberra, then we are the best choice for you and your family. Instead of having dentures, you can have a dental implant instead and our dental surgeons have a wealth of experience in this field and the qualifications to match. Just make an appointment to see Nithya and she can advise you with any dental implant inquiries that you may have. If you require root canal therapy or you think you might need this procedure, we can advise you on the best course of action that needs to be taken. We will determine if any therapy is necessary or not via x-rays and checking your symptoms. Signs of infection can include pain and swelling, we will choose the correct method of treatment for you and provide you with a complete breakdown of costs and options for payment. We are preferred providers for patients who are covered by HCF and CBHS. These patients will get two free check ups per year if you are with them. All health funds are accepted by Weston Dental Surgery and we use HICAPS to save you time with dealing with health insurance branches. Department of Veterans Affairs Gold Card holders are entitled to free treatment from us. We are members of the Child Dental Benefits Scheme, which means there will be no extra cost for your childrens dentist Canberra care and cover. If you need a Weston Creek dentist, or a Woden dentist, or even a new Canberra dentist, look no further. We are based in the Weston suburb of Canberra, but we cover the whole of the city for all of your dental needs. Here at Weston Dental Surgery we pride ourselves on being a family orientated dental practice that offers cosmetic and general dentistry for all ages. Give us a call today on 02 6288 9448 and have a chat to one of our helpful and friendly dental receptionists to book an appointment.